Disney Vacation Club has announced the name of its new development at the Wilderness Lodge resort. Copper Creek Villas & Cabins at Disney's Wilderness Lodge is the name of what will become the 14th Disney Vacation Club Resort. As part of the new naming, the original Disney Vacation Club property at Wilderness Lodge, the Villas at Disney's Wilderness Lodge, will be renamed Boulder Ridge Villas at Disney's Wilderness Lodge. The Pangani Forest Exploration Trail at Disney's Animal Kingdom will soon be returning to its original name - Gorilla Falls Exploration Trail. The exhibit was renamed Pangani back in July 1998, to better represent the fact that the trail was not just home to gorillas. Eighteen years later, Disney has decided to go back to the original, and from Memorial Day Weekend, it will once again be known as Gorilla Falls Exploration Trail. Disney has just that Frozen Ever After at Epcot will open on June 21, 2016. 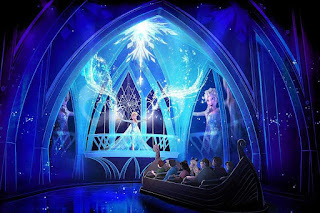 Also opening June 21 will be Royal Sommerhus, the Frozen meet and greet venue. Both Royal Sommerhus and Frozen Ever After will open at 9:00am daily, instead of the usual 11:00am opening for World Showcase attractions. FastPass+ for Frozen Ever After will be available from Saturday May 21. Disney has announced that the next generation Star Wars fireworks show will debut June 17, 2016 at Disney's Hollywood Studios. Ongoing construction of the Star Wars fireworks show. "This new nighttime show, which will be the most elaborate fireworks display in this park’s history, will begin nightly performances on June 17. This elaborate show will combine fireworks, pyrotechnics, special effects and video projections that will turn the park’s Chinese Theater and other buildings into the twin suns of Tatooine, a field of battle droids, the trench of the Death Star, Starkiller Base and other Star Wars destinations. And the show, which will feature music from throughout the film franchise, will be punctuated with a tower of fire and spotlight beams, creating a massive lightsaber in the sky." The Jungle Book: Alive with Magic will officially open on May 28, 2016 at Disney's Animal Kingdom. There will be two shows per night with the first at 9:00pm and the second at 10:30pm. 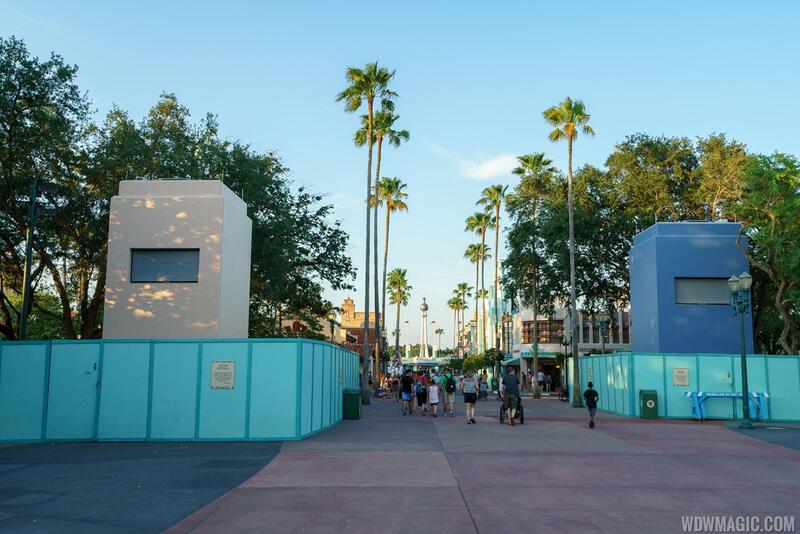 FastPass+ guests will be seated in the theater on the Asia side, while standby and dining package guests will be seated on the DinoLand side theater. Guests with strollers seated on the Asia side will park near to the gibbon exhibit, and guests on the DinoLand side with strollers will park in the Finding Nemo stroller parking area. The show is approximately 20 minutes long. Disney has updated their web site with a description of the show. FastPass+ and dining packages for the show will be available from May 21, 2016. The dining Package will include reserved seating for the nighttime show. At all-you-care-to-eat Tusker House Restaurant, you can choose the breakfast, lunch or dinner buffet on the day of the show (but you have to dine at least 2 ½ hours before the show). Breakfast is $37, $23 ages 3 to 9, plus tax and gratuity; lunch and dinner, $49, $30 ages 3 to 9, plus tax and gratuity. Tusker House Restaurant is on the Disney Dining Plan and counts as one table-service meal. Reservations opened on May 21 for Dining Packages for The Jungle Book: Alive With Magic nighttime show, and can be made by visiting DisneyWorld.com/dine or by calling 407-WDW-DINE. Disney has also given us a behind the scenes look of the making of the show. The Magic Kingdom will debut a new live castle show on June 17, 2016 - Mickey's Royal Friendship Faire. Featuring characters from “The Princess and the Frog,” “Tangled” and “Frozen,” the new show will include an original song, memorable music, lively dancing and special effects magic. Disney's Hollywood Studios has rolled out a new dining option just ahead of the busy summer season. Echo Lake Eats is a group of three kiosks alongside Echo Lake, just across from Indiana Jones. The setup is just like Epcot's Food and Wine Festival, with a separate line for ordering and then pickup at the kiosk. There are a limited number standing room tables in the general area around the kiosks. Each kiosk offers 2 main dishes, priced around $12 to $14. There are also alcoholic beverages at each. 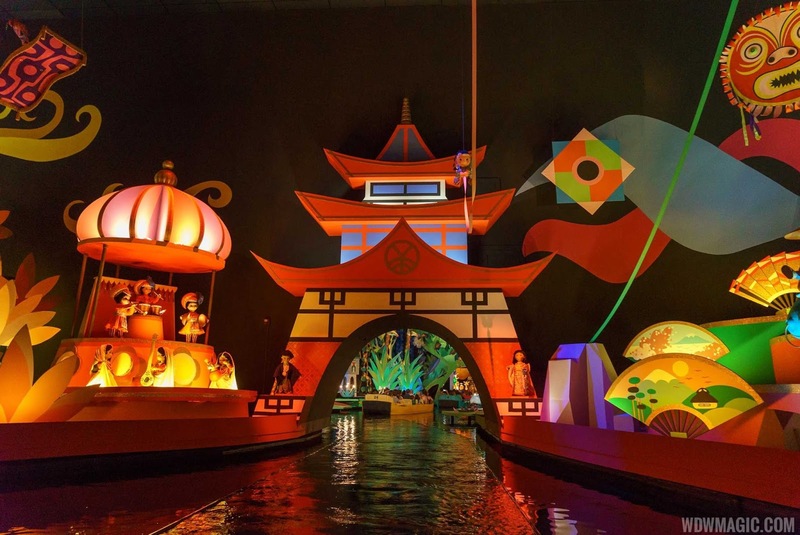 "it's a small world" at the Magic Kingdom will be closed for refurbishment this summer. The closure is scheduled to begin on August 22 through to September 15. Disney's Hollywood Studios is now offering preferred parking, which makes the service available at all four Walt Disney World theme parks. Priced at $15 in addition to the regular $20 parking fees, the preferred parking area is located near the front of each parking lot. At Disney's Hollywood Studios, preferred parking is in the Stage lot, at Disney's Animal Kingdom in the Peacock lot, at Epcot in the Amaze lot, and at Magic Kingdom in the Jafar lot. Preferred parking is also available for $15 to guests who current receive free parking, such as resort hotel guests or Annual Passholder. 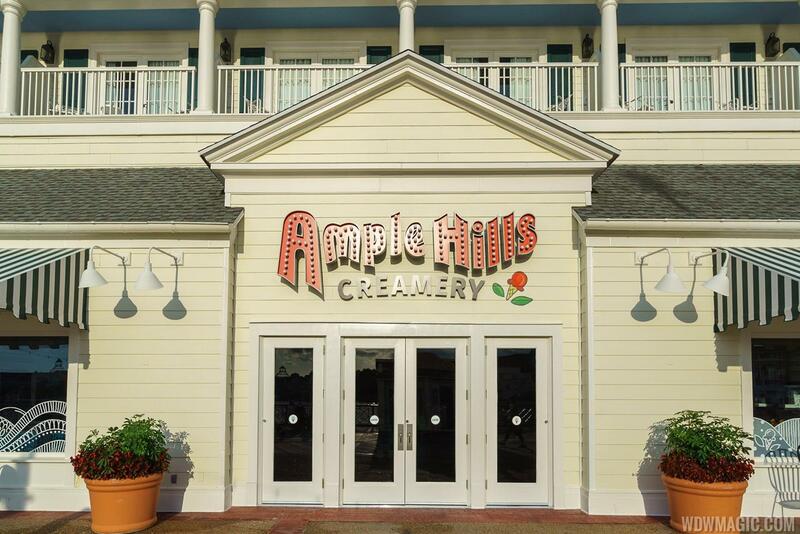 Ample Hills Creamery, the latest high-end ice cream store at Walt Disney World, is now open at Disney's BoardWalk. It will be located in the former ESPN arcade. Ample Hills is a spin-off from the Ample Hills Creamery in Brooklyn NY. 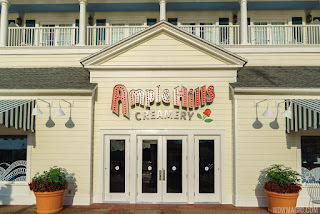 Ample Hills Creamery ice cream is made by hand, using grass fed cows milk with organic cane sugar, and even the mix-ins are made in-house from scratch - very much like a bakery There are a lot of flavors, over ten, and the flavors change often. There is even an exclusive Ample Hills flavor created just for the BoardWalk, which is a fluffy orange marshmallow ice cream with housemade salty chocolate seashells. Other flavors include Baked/Unbaked - vanilla ice cream with pieces of housemate chocolate chip cookies and browner butter cookie dough and PBwins the Cup - vanilla ice cream with peanut butter chocolate flakes and housemate peanut butter cups. A small cup is $5.79, and a large $7.49. A sundae, which has a base of either a brownie or Ooey Gooey Buttercake, an ice cream and a topping, is $8.49. Cones are priced between $5.79 to $7.79 for a small, depending on the type of cone. You can also get a milkshake for $8.49. The long awaited third track at Toy Story Mania at Disney's Hollywood Studios has finally opened. Guests enter Toy Story Mania through either the existing standby for FastPass+ lines. Once at the merge point, guests are then either directed up a staircase to the original two tracks, or via a doorway to the new third track.